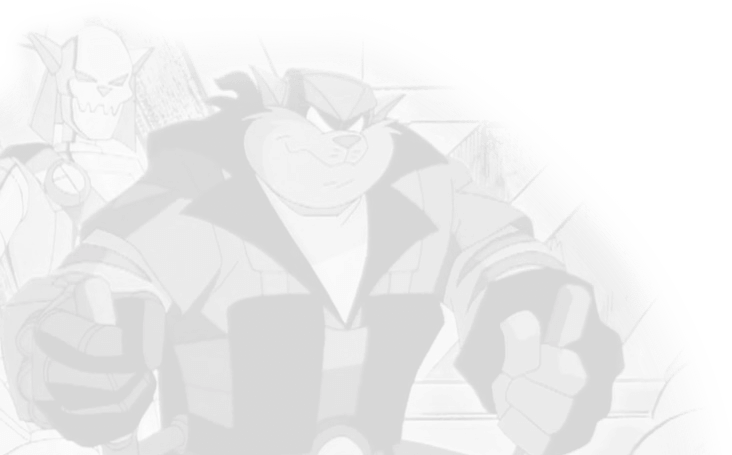 Title: The End of The SWAT Kats?! Warnings: Consumption of alcoholic beverages (beer), use of prescription drugs (aspirin), usual amount of violence for the show. Author’s Comments/Notes: Inspired by the fact that while the SWAT Kats are off fighting evil, no one is there to run their business. The gigantic cloud, perhaps a mile in width, was hovering low over Mt. Anakata as the three helicopters dispatched from the mainland flew towards it. The lead helicopter was a Megakat Geological Society chopper equipped with high-tech sensor equipment, and it was flanked by twin Enforcer choppers. Much to Mayor Manx’s consternation, the island had been cleared of civilians and park employees on the orders of Commander Feral for safety reasons. Megakat City’s finest geologist, Dr. Anna Ignimbrite, wasn’t sure if the cloud meant Mt. Anakata was going to erupt, but she was determined to find out. “It’s trouble if you ask me!” opined one of the Enforcer pilots over the radio. The Geological Society chopper banked into the cloud, the two Enforcer aircraft following it. Dr. Ignimbrite frowned as she consulted her thermal imaging scope. Nothing beyond the usual levels of volcanic activity. Nothing suggesting Anakata was about to blow its top. Suddenly, the device began beeping loudly. Something absolutely gigantic, smaller than the cloud itself but still quite large, was being picked up by the scope. “Is the volcano gonna blow?” asked her pilot worriedly. Through the dense fog of the cloud, Ignimbrite and her pilot beheld a vague gigantic shape looming before them. Suddenly, there was a bright green flash which engulfed the helicopter. The two shielded their eyes, and, with a sizzling explosion, the Enforcers watched through the haze as the Geological Society chopper disintegrated. He didn’t finish. A second flash, a beam of some kind, shot forth and hit the first Enforcer chopper. It blew apart. The second made a hard turn and began heading out of the cloud, its pilot frantically reporting on what just happened. He managed to blurt out that some kind of beam weapon had destroyed the other two aircraft before his own was struck, tail-first. He screamed as the helicopter spiraled wildly out of control, down into the molten lava of the volcano. Inside the cloud was the Fear Ship, a giant flying base of operations emblazoned with “D” insignia all over and bristling with energy cannons. In the main control center aboard the great vessel, three figures in purple military style dress stood staring up at the giant viewscreen, watching as the final chopper splashed into the lava. Blim took his finger off the firing button. He was a smug, overweight cat whose uniform bore a stylized “1” on the chest. The trio turned turned to face the great figure upon the huge throne on a dais overlooking the cavernous control room. “The threat has been neutralized, Lord Dark Kat,” Blim reported. “There will be no next time!” Dark Kat snarled. Suddenly, a dozen Creeplings swarmed from the shadows and surrounded Blim and grabbed him by the arms. The lead technician was lifted off his feet and flown through the air. A trapdoor opened, revealing the dark cloud and the molten lava below. Blim was dropped through this with a shrill scream. The trapdoor boomed shut, and Dark Kat looked at the two remaining technicians. One was Marlow, a handsome young cat with blonde hair and the number “2” on his uniform. The other, Zeckis, was middle-aged with already-thinning brown hair. His uniform said “3” it. “You are in command now, Marlow!” he said. Marlow smirked at this and nodded. “This is Ann Gora, Kat’s Eye News, coming to you live from the site of the Megakat City Main Power Grid!” the voice said. Murray, half-asleep slouched in a shabby office chair, opened his eyes and yawned, stretching. The mini-TV in his lap rocked gently as he did so, but he managed to get it steady again. Murray shifted, reaching into a white plastic cooler. He retrieved a can of beer, popped the top, and took a swig. He belched loudly. On the TV screen, behind Ann Gora, he could see Enforcer cruisers and tanks arriving. A ticker ran beneath the screen reporting something about three helicopters destroyed over Anakata Island, where that weird cloud was, but Murray ignored it. Suddenly, a figure appeared on the roof of the building and launched a volley of yellow electrical bolts down on the Enforcer vehicles. “Hard Drive is attacking the Enforcers!” Ann went on, ducking down, the view becoming wobbly as her cameraman did the same. “Duh,” Murray said, letting loose another belch. Another swig from the beer was taken. Onscreen, the Enforcer vehicles that were hit exploded in showers of sparks and molten metal, the gathered Enforcer commandos ducking and running. A few managed to leap from the tanks before they exploded. Obviously, Murray thought, this Hard Drive character had amped up his powers since his last appearance the previous year, when he tried to rob the Megakat Mint high-speed railway. Murray had caught that on the news, too, and the whole thing amused him. The short cat watched the Kat’s Eye News coverages of various villain attacks with all the attention he would give a fictional action show. Murray’s eyes lit up. “Yeah, now we’re talkin’!” he said. Things always got going when the SWAT Kats arrived. Murray looked forward to seeing them pummel the tar out of yet another villain. He loved nothing more than seeing such chaos and destruction on TV. But, just as the SWAT Kats’ sleek black fighter jet, the Turbokat, flew into view, a voice from outside interrupted Murray’s TV time. “In here, Burke!” he yelled back. Sighing, Murray turned off the TV, just as a big explosion occurred. Whatever his big brother wanted had darn well better be important enough to make him miss what he considered quality programming. Setting the TV on the table beside him, Murray hopped out of the chair, tossing the empty beer can into the nearby trashcan. He stepped out of the small, two-room building that was the main salvage yard office. Unlike their wards, ex-Enforcer pilots-turned mechanics Chance Furlong and Jake Clawson, Burke and Murray didn’t live at the yard. The two brothers worked there, however, and spent most of their time lounging in the office. They only ever went out for pizza or when Commander Feral sent them to collect scrap. Wondering what Burke was talking about, Murray followed his brother as they walked around one of the yard’s many piles of junk. They approached the modest two-story brick building that was Jake and Chance’s Garage. A blue four-door car was parked out in front, and standing next to it was a little old lady. Murray blinked. Murray realized he’d said the wrong thing when the seemingly harmless old woman, who was obviously cranky after waiting all day, didn’t like that answer. With a growl, she brought her large purse down onto the smaller kat’s head. “Hey, you old battle ax! Don’t hit my brother like that!” Burke said. Before he could move to Murray’s defense, the handbag came into contact with his left knee. Yelping, Burke clutched his leg and hopped up and down on his other foot. She then whacked Murray on the head again, his green baseball cap flying off. Ducking to avoid another blow, he retreated into the open garage. Burke opened his mouth to speak again, but this time he took a hit in his large stomach. “Well that ain’t gonna happen until Furlong and Clawson get back!” Burke reasoned. Getting into her car, she stepped on the gas and sped right out of the salvage yard like a professional race car driver, leaving Burke and Murray gasping and dumbfounded. After picking up his cap and replacing it on his head, Murray went with Burke and they walked around to the back of the building, where the two-ex-fighter jocks usually parked their only other vehicle. To their shared surprise, however, the green four-door sedan was still sitting where it always did. “That certainly is strange,” said Burke. “Where did they go if they didn’t take either the tow truck or the car?” Murray wondered aloud as he and Burke walked back to the front of the garage. “I’ll bet you anything they’re inside watchin’ TV or somethin’,” said Burke. “Yeah, ’cause otherwise I can’t see where they’d go by walkin’; the only thing within walkin’ distance is that oil refinery,” added his brother. Balling up their fists, the two junkyard kats walked into the garage and went inside the living quarters through a side door. First, they spent a good few minutes calling Clawson and Furlong’s names. When that got no results, they started to actually worry whether something had happened to the two. They split up and searched the place. Murray went upstairs, but found it deserted. “Hey, Murray!” Burke suddenly called. Murray hurried back downstairs. He found Burke in what could ostensibly be considered the living room; there was a couch fashioned from the back seat of a car, a fridge, and a TV. “Well, then why were you yellin’?” Murray said, rubbing his head. “So, you’re sayin’ there’s a whole underground complex under our feet that nobody’s been down to in over fifty years?” There was wonderment in Burke’s voice. Burke growled as Murray continued down, laughing. The shorter kat’s feet came into contact with a concrete floor a few feet down and he stood there, squinting in the darkness. To his right, he spotted something. “I found a light switch!” he called up to Burke. “So, turn it on, you idiot!” his brother shot back. Grumbling, Murray did so. The fluorescent lights flashed alive, revealing to Murray something that made his eyes pop wide open and his jaw drop. He stood this way for several minutes until Burke called down. Burke compromised, leaning over and sticking his head in through the hole upside-down. His reaction mirrored Murray’s. Commander Ulysses Feral grumbled to himself as he entered his office, removing his overcoat and throwing it at the coat rack, missing. The coat fell to the floor as he went to his desk, slumping into his office chair. This was turning into a very, very bad day. First, the incident occurring over at Anakata Island had taken a turn for the worse with the loss of one Megakat Geological Society chopper and two Enforcer choppers, to say nothing of one of Megakat City’s foremost geologists, and then he had been humiliated by the SWAT Kats… again. The Enforcers had been all but wiped out by Hard Drive in the battle at the Megakat City Main Power Grid. Although there were few casualties, the vehicle loss was incalculable as always. It was at this point in his thoughts that Sergeant Talon entered the room. He frowned, picking up Feral’s coat and hanging it on the coat rack. Feral leaned back in his chair, then looked at Talon. “Yes, please…” Feral said, feeling himself smile at how well the Sergeant knew him and his constant headaches. The Sergeant left the office, leaving Feral alone. He wondered to himself if he should really go through with these constant vows he had made to arrest the SWAT Kats, since they did help save the city all the time and had even saved him once or twice, in spite of their mutual hatred for one another. But then, he shook away the doubts. When he had taken the job as Commander of the Enforcers, he had sworn an oath that he would rid Megakat City of any and all criminal element. And, despite their constant heroics, the SWAT Kats were criminals. Vigilantism, taking the law in one’s own paws, was illegal. It was his duty to arrest them and bring them to justice like any other criminal in the city, or so he kept telling himself day after day. His thoughts were interrupted as Sergeant Talon returned with a bottle of aspirin and a glass of water. He nodded in thanks and popped two of the pills, swallowing them down with a quick gulp of the water. Feral nodded and drained the rest of the water, setting the empty glass on his desk along with the bottle of aspirin. He leaned back in his chair once more, folding his hands across his lap. As the Sergeant turned and left the room again, Feral massaged his temples one last time and, praying the aspirin would work fast, began to start going over the aforementioned paperwork. Mere moments later, Sergeant Talon returned. “Commander,” he said. “Those two junkyard cats are here to see you,” Talon replied. Talon stepped aside, allowing the gruesome twosome that was Burke and Murray to enter the office. They had unusually sly smiles on their faces and seemed to be very anxious about something. “Hiya, Commander,” said Murray, grinning toothily. T-Bone dove out of the way as the electricity hit the ground near his feet, landing on his shoulder and somersaulting behind a concrete divider. Razor was already hunkered down behind an abandoned car to his right. After a grueling chase through downtown, Hard Drive had chosen to situate himself in the middle of the Megakat Freeway, bringing traffic to a halt as the citizens abandoned their cars and ran away. T-Bone had to land the Turbokat several yards away in an empty field, and after twenty minutes, this was as close to Hard Drive as either of the SWAT Kats had gotten. “Aww, well then, let’s play!” Hard Drive snarled. He lifted up his arm, firing bolts of electricity at the empty car Razor was hiding behind. The bolts hit the vehicle, shattering the glass and melting the metal. Razor jumped out from hiding and dashed over to where T-Bone was. Hard Drive noticed, but wasn’t fast enough. His electrical bolts scorched the ground seconds after Razor was behind the divider with his partner. He fired on the divider, sending chunks of concrete in all directions and blowing both SWAT Kats backwards several feet. Razor landed flat on his back, but T-Bone managed to land with his palms touching the ground and flipped back over right-side up and landed on his feet. He looked at Razor, who didn’t get up, and growled. Amused, Hard Drive crossed his arms. Once more, Hard Drive lifted his arms, electricity sizzling on his fingertips, and T-Bone had nowhere to run. Suddenly, a volley of laser fire hit the ground near Hard Drive’s feet, and he stopped and leaped aside to avoid being hit, yelping in surprise. T-Bone looked up in time to see a trio of Enforcer choppers hovering in the sky above the freeway, their side-mounted laser cannons blasting away at Hard Drive. He danced aside again and let fly another of his deadly bolts. The electricity struck the chopper, and T-Bone thought it must have hit the fuel tank, because instantly the chopper exploded in a huge fireball. The other two choppers veered left to avoid both the explosion and Hard Drive’s electrical bolts, as flaming debris showered down onto the freeway. As he prepared to fire again, T-Bone realized this was his chance. He brought up his Glovatrix. The small blades flew from T-Bone’s Glovatrix straight at Hard Drive, who tried to dodge, but they hit their intended target. He yelled as his Surge Coat was slashed, cutting wires and rupturing the battery cel. Almost immediately, the suit began to power down, the blue electrical aura around him vanished, his mohawk sagged, becoming a shaggy mop. He looked disbelieving at T-Bone as pupils appeared in his eyes once more. “And, this time, it’s gonna cost you!” T-Bone snarled. Devoid of his powers, Hard Drive screamed and ran from the angry SWAT Kat. Before he could get very far, one of the two remaining Enforcer choppers touched down in front of him, and Lieutenant Felina Feral, flanked by a pair of brutish Enforcer commandos, hopped out, guns at the ready. Hard Drive skidded to a halt. “Got to get away!” he squealed. “Not this time, Hard Drive,” Felina said. She leveled her gun at him. “Cuff him,” Felina said. The two Enforcer commandos came forward and slapped the cuffs onto Hard Drive. T-Bone, meanwhile, was kneeling beside the prone Razor. As the commandos led Hard Drive to a waiting Enforcer cruiser, Felina ran over to T-Bone’s side, holstering her gun. T-Bone was checking Razor’s pulse. He gently slapped Razor’s cheeks, and the smaller SWAT Kat blinked awake slowly, and coughed, sitting up. T-Bone smiled and patted his partner on the back and helped him to stand up. “Well, I’d say you got knocked out by a blast of electricity and I took down the bad guy, but I don’t wanna bruise your ego, buddy,” T-Bone chuckled. By now, a slew of reporters from Kat’s Eye News, Inside Megakat City, and other newsgroups had arrived on the scene and were being held back by the many Enforcer commandos that had arrived. Cleanup crews were also on hand to clear away the debris so that the motorists could begin using the freeway once again. With all the commotion, the SWAT Kats seemed a bit uncomfortable. Laughing, T-Bone and a still-somewhat groggy Razor slipped away between the abandoned cars and back to the field where they had left the Turbokat. Felina watched them get in, and a few moments later the jet was all powered up, rose into the sky, and took off. Then, returning to her duties, she walked back over to where her fellow Enforcers were still quite busy. One of the commandos approached and saluted, Felina returning the gesture. The commando saluted and hurried off, while Felina walked back to her parked chopper and climbed back into the pilot’s seat. flicking on the band, she brought the radio to her mouth. “Lieutenant Felina Feral to headquarters,” she spoke into it. “Yes, Lieutenant,” came the gravely voice of an Enforcer dispatcher. “Patch me through to my uncle’s office,” she said. “I’m sorry, Lieutenant, but Commander Feral is not in at the moment,” the dispatcher replied. Felina blinked. “Where is he? Anakata Island?” That was the only place she could think of for her uncle to have gone. “All right, thanks, dispatch,” Felina said at length. “Any time, Lieutenant,” the dispatcher replied, then he hung up. Felina did the same, and leaned back in her seat, thinking. Where had her uncle and the Sergeant gone in such a hurry without telling anyone where they were going? And, with Burke and Murray of all people? Commander Feral stepped out of his personal cruiser, adjusting his overcoat. He had followed the two junkyard cats, Burke and Murray, in their dump truck as they had requested, and he now found himself standing in the city salvage yard. Sergeant Talon got out of the opposite side of the cruiser; Feral had opted to bring his Sergeant along just in case he needed backup. He watched as the huge, noisy truck ahead of them shut off its engine, Burke and Murray hopping out and gesturing excitedly. Feral and Talon crossed the yard to where the brothers stood. “This had better be good; we have a situation developing over at Anakata Island that could really use my attention,” Feral said, pointing at Murray with his baton. He was slightly miffed that Burke and Murray had chosen not to tell him just what they were going to show him, and he found himself wondering why he’d even agreed to come along in the first place. The smaller cat led the way, Feral, Sergeant Talon, and the hulking Burke plodding after. The small group approached the front of the establishment known as Jake and Chance’s Garage. He scoffed, remembering those two insolent toadies. “Aren’t they–” Sergeant Talon began. Talon nodded as he and his superior officer followed Burke and Murray in through the garage, past the parked orange tow truck, and into the living area through a side door. Feral grimaced. The place wasn’t unsanitary or anything, but it was still a mess. Empty milk cans everywhere, candy wrappers, and so forth. “What kinds of secrets?” Feral asked, arching a brow. “Clawson and Furlong are, uh… well it’s hard to explain. You’d better look for yourself, Commander,” Burke said, and then he knelt down near where there was a ratty-looking rug on the floor. He pulled it back, revealing to Feral what looked like some sort of hatch. He suddenly felt proverbial butterflies in his stomach as Burke turned the handle, popping the hatch open. Feral nodded, handing Murray his baton, and, turning, he went into the hole and down the ladder backwards. He felt his boots scrape against concrete a little ways down and stepped away from the ladder. Sergeant Talon climbed down after him, and Feral waited until his subordinate had joined him before he located the light switch, just as Murray had promised, to his right. Flicking it on, Feral felt and practically heard his heart skip a beat as he beheld a large chamber with cement walls, floor, and ceiling. The room was mostly empty save a couple of tables with various odds and ends that, from Feral’s vantage point, couldn’t readily be made out. Feral turned and went slowly down the short stairs to his left. “Look at this,” he said as he saw that the wall next to him was covered in little skull-and-crossbones that had been stamped onto it. A stamp pad and inker, he noticed, sat on a small shelf nearby. “Looks like some kind of scorekeeping display,” said Sergeant Talon as he started down the stairs after Feral. The Commander approached one of the tables, wanting to get a closer look at some of the items he’d spotted on them. He frowned as he picked up a glovelike device that looked as though it was made to slide over the wearer’s forearm. Talon stepped up beside him, clearing his throat. “Uh, sir, is this place what I think it is?” he asked. Sergeant Talon’s normally lidded, drowsy-looking eyes widened in surprise at Feral’s words. 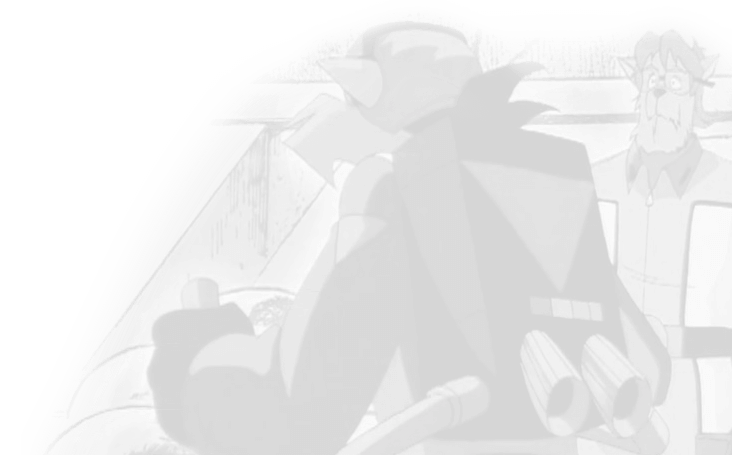 Feral set down the device, which, if he remembered correctly, the SWAT Kats called a ‘glovatrix,’ and turned to Talon. “Yes, sir,” the Sergeant replied. He turned and hurried back to the ladder, climbing up. Feral absently licked his lips, only to discover his mouth was dry. If this was what he thought it was… Turning, he spotted a set of lockers against the far wall. Etched onto the two doors were the names ‘T-Bone’ and ‘Razor.’ Feral grinned, happy for the first time today. In fact, for the first time in a good, long while. There was no longer any doubt in his mind that he was standing in the lair of the SWAT Kats. “Didja see it?” Burke asked excitedly as Sergeant Talon emerged from the hatch. “Yeah,” said Talon. He quickly walked across the room and out through the garage, heading for Feral’s parked cruiser. After standing there for a moment wondering why Feral didn’t come up, Burke and Murray followed the Sergeant. He opened the door and climbed into the driver’s seat, getting the radio going. “So, uh, this is big, right?” Murray asked. Burke and Murray grinned at each other. “So, uh, what are you gonna do?” Burke asked. “Oh, boy! So, we’ll go down in history as the guys who found the SWAT Kats’ secret lair, huh?” gushed Murray. Growling, the brothers turned and stalked towards their truck as Talon contacted Enforcer Headquarters and requested immediate backup. Meanwhile, the Turbokat was in the process of flying across the bay toward the peninsula where the salvage yard was. In the pilot’s seat, T-Bone yawned. He hadn’t gotten much sleep last night, thanks to indigestion caused by some particularly spicy pizza, and the day’s lengthy battle with Hard Drive hadn’t help make T-Bone any more awake. The adrenaline rush from the fighting was gone, and now T-Bone was ready to hit the hay. “When we get home, I’m going straight to bed, buddy,” he said to his partner. “I told you not to eat spicy foods right before you go to sleep,” Razor said. For the third time, too. “Yeah, yeah,” T-Bone grumbled as he flew the jet over land now, circling around so that he could fly into the hangar. As he brought up the remote control that operated the tunnel’s hidden door, he happened to glance down and was surprised to see an Enforcer cruiser parked in the yard. Burke and Murray’s truck was there, too, driving out of the yard, but that was hardly surprising. After all, they worked at the salvage yard too. But, what was an Enforcer cruiser doing there? T-Bone clicked the remote control, activating the tunnel door, and he flew the jet towards it as it slid open. Commander Feral was inspecting the lockers, a spare red and blue helmet in his hands, when he heard and felt the turning of enormous gears nearby. He quickly put the helmet back into the locker and, in an unusual state of panic, hastily looked around for a hiding place. He found one behind a console of some kind, and none too soon as, through the gigantic circular hole in the middle of the cavernous room, the Turbokat rose on a hydraulic platform. Feral peered around the corner of the console and watched as the canopy of the Turbokat’s cockpit, revealing T-Bone and Razor. So, thought Feral, the SWAT Kats are Chance Furlong and Jake Clawson. How could he have been so stupid not to have made the connection before? Then again, the only time he had really spoken to Furlong and Clawson and stood face to face with them was the day he fired them for letting Dark Kat escape and destroying half of headquarters. Still, it made sense that the SWAT Kats, two highly skilled pilots, would be ex-Enforcers. “Pretty swell action today, huh, buddy?” Razor asked as he removed his flight helmet as he and T-Bone hopped down to the floor from the Turbokat. “Yeah, I never get tired of putting that techno-freak Hard Drive in his place,” T-Bone concurred, also removing his helmet. Feral ducked back behind the console further as T-Bone and Razor walked across the hangar to their lockers. They made it there before Feral leaped out at them from his hiding spot behind the console over by the far wall. Yes, Feral thought, today was turning out to be one of the best days of his life. He finally couldn’t wait any longer and leaped out at them, laser pistol up. The deep voice cut T-Bone to the bone as surely as if he’d been stabbed. Despite everything, he and Razor found themselves with Commander Feral of the Enforcers standing in their secret hangar, aiming a laser pistol at them. T-Bone, in the midst of grabbing the rubber stamp to add another “kill” mark to their Wall of Fame, dropped the stamp to the floor. Razor’s jaw fell open and his helmet joined the stamp in hitting the floor. It rolled over Feral’s feet, and the Commander annoyedly kicked it away. A huge grin came over the big kat’s face. “We, uh, we don’t know what you’re talkin’ about, Feral!” Razor tried to bluff, grinning nervously. T-Bone acted without thinking. His helmet left his hands and flew across the room, hitting Feral’s arm. He fired reflexively, the laser blast punching a hole in one of the locker doors. Razor’s, T-Bone noted with some guilt. Even as Feral staggered back, T-Bone grabbed the surprised Razor’s sleeve and was dragging him to the ladder. Suddenly he saw the feet of the descending feet of Sergeant Talon. “Can’t go that way!” T-Bone said and whirled back towards the Turbokat. Feral grabbed his laser pistol and got up, firing off some warning shots above their heads. T-Bone again whirled, and, again, poor Razor was jerked around with a small cry. Back to the ladder where T-Bone grabbed Sergeant Talon’s belt as he was halfway down and yanked, sending the husky Enforcer officer tumbling head over heels harmlessly to the floor. The Sergeant did a somersault and rolled into Feral, knocking them both down even as the SWAT Kats climbed up and into the garage. Razor was trying to protest, but T-Bone wouldn’t let him. Ultimately, he decided that even if he talked his partner into thinking rationally, Feral wasn’t interested in their explanations. And, he had an itchy trigger finger. Especially now that T-Bone bowled another Enforcer right into the big lug. So, for the moment, Razor resolved to go along with whatever it was T-Bone was planning and sort things out later once they’d escaped and things had calmed down. Apparently, T-Bone’s plan involved driving, but the tow truck was a no go. In the heat of the moment, the truck’s exit from the garage was blocked by the parked Enforcer sedan. The driver’s side door was open, and, checking it, they found no keys. T-Bone’s claws came out, and he shredded the plastic beneath the steering wheel, digging wires out. In a couple of moments he had the Enforcer vehicle hotwired, the engine roaring. Both SWAT Kats jumped in, and T-Bone gunned it backwards, fishtailing the cruiser around just as Feral and the Sergeant emerged from below and came running out of the garage, laser pistols out. They fired at the escaping Enforcer car as it sped off across the scrapyard, narrowly avoiding the shocked Burke and Murray. T-Bone spun the wheel to avoid running the brothers over and still the pair had to jump aside into a junkpile. The rear bumper clipped a rusty engine block and then the cruiser shot out onto the country road that ran alongside the yard. A honking horn alerted them to a beat-up old sedan with a little old lady barely peeking over the wheel. She yelped and swung her wheel, the car going into a ditch as the Enforcer cruiser shot past. “T-Bone, may I ask what exactly we’re doing?” Razor asked, hurriedly buckling in. “Running, what’s it look like?” T-Bone neglected to buckle his own seatbelt, gripping the wheel so tightly his knuckles popped. A panic like he’d never felt gripped the burly cat. “Says who?” T-Bone asked. A glare from Razor banished that thankfully only half-serious thought from his mind. T-Bone was willing to do a lot of things for his own survival, but as much as he detested Commander Feral, murder wasn’t one of them. He drew the line at that. Still, he floored the pedal with no other plan at the moment besides getting away. “Anyway,” he said, “we don’t need to. We got a good head start on ’em, and we got their car, too.” He smirked. The smirk was wiped from his face as a laser blast flew by, and in the sideview mirrors the two beheld the most unwelcome sight of their own tow truck following them. Talon was driving, Feral leaning out the passenger window, firing after them with his gun. Ahead, another cruiser sat parked on the roadside. In the driver’s seat, Officer Jablonsky sat aiming a radar gun at passing vehicles. To his annoyance, they were all well below the speed limit. Beside him, Officer Lyman, his partner, was prattling on about Lieutenant Feral, the Commander’s niece. Specifically, what type of underwear she wore. “I’m tellin’ ya, man, she digs me!” Lyman insisted. Suddenly, they heard the roar of an approaching motor and saw a command sedan go flying past, doing 100 according to Jablonsky’s radar gun. The tow truck flew past, and the two could clearly glimpse Commander Feral in the passenger seat. Dropping the radar gun, Jablonsky started the cruiser up and pulled onto the road, heading off after the other two vehicles while Lyman got on the radio and called in to Enforcer Headquarters. In the tow truck, Feral fired off a couple more shots at his own car and slid back inside. He angrily pounded the dashboard with his fist, and suddenly a control panel popped up into view, previously hidden. He and Talon examined this, and, after a moment, Talon pushed one at random, and suddenly the two Enforcers were thrown backwards into their seat cushions as the tow truck flew forwards propelled by powerful rocket boosters. This did not go unobserved by the escaping SWAT Kats, who braced themselves as the rocket-propelled tow truck flew up and rear-ended the Enforcer cruiser, crumpling the back end and knocking the already speeding car forward a ways. “T-Bone, may I suggest we think this whole ‘escape’ thing through a little further…?” Razor said with a sigh. As they neared the bridge which connected the little peninsula to Megakat City, the loud roar of rotor blades filled the air as three Enforcer choppers appeared overhead and began closing in. Glancing back, Razor could see the other cruiser in the distance behind the wildly speeding tow truck. Whipping his head around he could see still more Enforcer vehicles setting up a roadblock at the bridge entrance. It quickly occurred to him that they weren’t going anywhere. “T-Bone, we had a good run, but for the moment, we have to give ourselves up!” he told his partner. T-Bone gritted his teeth in fury. But, he realized Razor was right. They were trapped. Short of driving into the bay, there was no way out. The Enforcers were winning by sheer numbers, boxing them in from in front and from behind. Finally, he squeezed his eyes shut and hit the brakes, spinning the wheel to the left suddenly. The Enforcer cruiser swung around sideways and skidded to a halt. Neither SWAT Kat resisted as the Enforcer commandos from the roadblock approached with laser rifles up and ordered their surrender. As they were being hauled out of the car and put into handcuffs, the tow truck came flying up the road, out of control. Everyone turned and yelled in surprise. Sergeant Talon swung the wheel, and the truck narrowly avoided hitting the kats gathered in the road, flying off the road, ramping off a small hill and finally splashing down noisily into the bay. It sank rapidly. A moment later, Commander Feral and Sergeant Talon broke the surface. Two commandos each were left to hold onto T-Bone and Razor; the others ran and waded into the water to assist their floundering Commander. They were joined by Jablonsky and Lyman when they arrived finally. The commandos helped Feral ashore, Jablonsky and Lyman got Talon. Both were soaking wet but unharmed. “Are you all right, sir?” a commando asked. A temporal loop, an alternate dimension, Dark Kat’s final victory and defeat. Completed. Rated M for violence.